Just a few years ago, at first glance completely unremarkable game called minecraft is released. There was nothing in it to attract the attention of an ordinary gamer - no good graphics, no plot! it did not even have modern textures! But the lack of beautiful patterns did not prevent it from becoming one of the most popular games on the planet! And all thanks to the amazing idea that was born in the head of just one person, who wrote the code for the first version of minecraft ! And the idea was that any person is placed on a vast territory resembling the modern world, but consisting of small cubes! And this man got the opportunity to create from them his world, placing these cubes one on another! An ordinary sandbox, but in a completely new, 3D version! But the creative regime, although it was very popular, was soon implemented by a regime for survival! And with the advent of this mode, the story of the game in minecraft has changed! This mode, thanks to almost complete, albeit arcade, simulation of survival could very quickly deliver this game to the very top of all gaming ratings! In this mode, people found themselves on a completely unfamiliar, randomly generated map. They could be near the sea and in the impenetrable jungle and even at the "north pole" where snow fell from the sky, and the whole earth was covered with ice and snowdrifts! Once in the location, you had to first get the tree, which was required to create wooden tools and weapons! Having made them, it was possible to begin to extract stone rocks, cut down the tree with an ax and fight off predators with the help of a sword. A brief review of the game Minecraft 3d What is the web version? 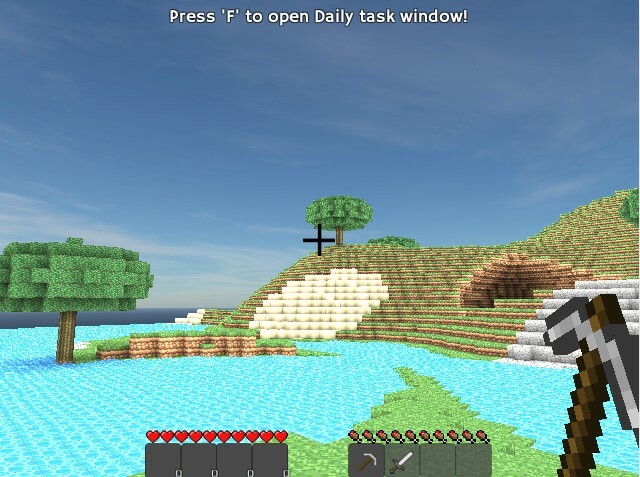 Game Minecraft 3d is very different from the original. First, it does not require any installation and works right in the browser. The truth is that you must have the Uniti 3D plug-in installed. It weighs much less, so it does not require a good connection to the Internet! Secondly, it was not created by the developers of the official version of the Minecraft , but is a clone, so it has many differences. Graphics are a little worse than the original, but only creative mode is available for play! There are animals here, though in a much smaller number than in the client version. Yes, play in 3d Minecraft can only be done alone, because the collective mode is not provided. But even carrying out easy tasks you still want to go all the way from beginning to end! And you can try to come up with and build a modern world! After all, you have many different blocks available! Build a castle or even an amusement park, or maybe you want to make an army of darkness with orcs, trolls and Sauron's tower! What do we have to do ? From the very beginning, you have everything you need - a sword, a pick and various blocks that you can bet with the right mouse button! And with the left button you can break any of the blocks. As in the original, here you have 9 lives that will be taken away if you fall from a great height or you are bitten by a predatory beast. If you run out of food, then every few seconds, too, will begin to take life. 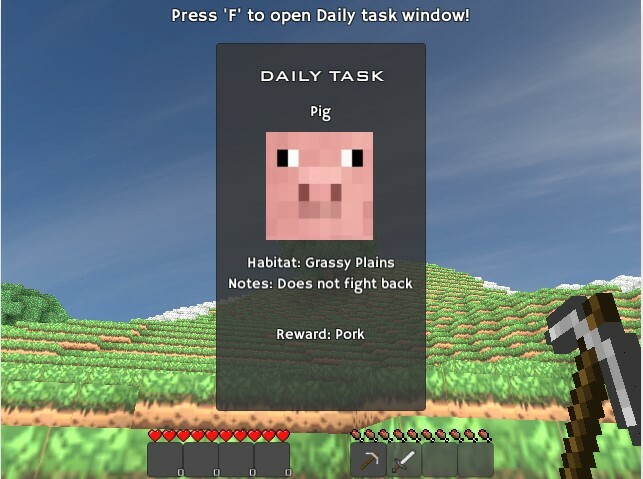 Your first task is to find pigs! Find them and catch the delicious meat, because without it you can not survive! To run fast and jump high, you need to eat well, so do not forget to catch pigs and other game getting meat! 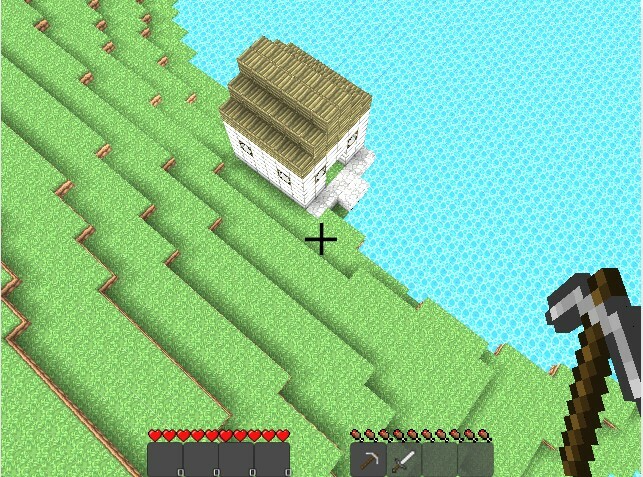 Wandering around the map, in addition to trees and mountains, you'll find uncomplicated buildings like houses and huts. In them you can find interesting things and new food. Devote yourself to performing dangerous tasks, in which you will need to travel a lot, and also to search for hidden things and animals! Play Minecraft 3d can be without registration and completely free. Thanks to the flash version, you can find out if you like this game and whether it is worth installing it on a computer or not! After all, a licensed Minecraft costs a lot of money for an ordinary schoolboy, so you will have to ask your parents to buy it, and you can enjoy your favorite entertainment for free with all your friends! Yeah your right it is awsome!!!!!!!!!!! some games are good but this looks like a rip off of the actual minecraft. 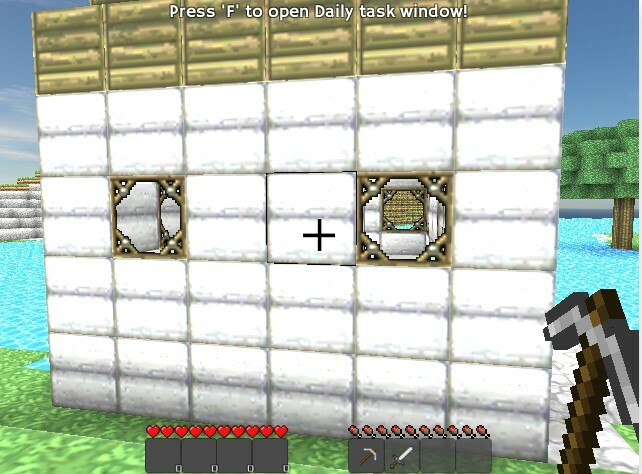 I have played the real minecraft it is better then this.